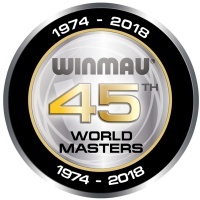 Following a dramatic weekend in Sweden, qualification for the 45th Winmau World Masters, the longest-running darts major, has now been concluded. Men ranked in the top 128 and Ladies ranked in the top 64 of their respective BDO Main Invitational rolling tables have qualified for the World’s longest running darts major. There is still seeding places to play for up until 9th September, as sixteen men and four women will earn the right to qualify as seeds into the last 32 and last 8 stages respectively. The seeds will be joined by other major title holders from around the world and the remaining players from the BDO ranking tables (male players in positions 17 – 128 and female players in positions 5 - 64) who will battle it out for one of the sport’s most prestigious titles at the Bridlington Spa on October 4th – 7th 2018. They will also be competing against the top performers from the BDO’s British Inter-County Championships (BICC) as well as former Winmau World Masters Champions. There are no surprises at the top of the BDO men’s ranking table with double Winmau World Master and two-time world champion, Glen ‘Duzza’ Durrant currently occupying the top spot. He’s followed by Mark McGeeney, runner-up in the event for the last two years. In third spot is Wales’ Jim Williams followed by former World Champion, Team Winmau’s Scott Mitchell. Currently in fifth is Scotland’s Ross Montgomery, just ahead of Team Winmau’s Scott Waites who, in addition to his two World titles, was a Winmau World Master in 2011. At the other end of the seed ladder, Wayne Warren’s 25 points after finishing third in the Swedish Open is enough to see him move into fifteenth. Scott Baker currently occupies the 16th seeded spot but Kyle McKinstry and Derk Telnekes are just 3 and 5 points behind respectively. Gary Robson, Wesley Harms, Michael Unterbuchner, Chris Landman, Dave Parletti, Willem Mandigers and Richard Veenstra currently occupy places seven to thirteen. There’s still plenty of ranking points up for grabs to those gunning for the seeded places, including the Category A Vizcaya Open that takes places this weekend. The England Classic and England Masters also takes place across the weekend of 7th - 9th September which will be the final events before the seeding cut-off. Team Winmau’s William Borland and two-time World Champion, Ted Hankey, will also be hoping to reach the later stages as they have qualified in the top 128 of the BDO ranking table, along with other famous names such as, Martin Adams and Andy Hamilton. In the BDO women’s rankings, there’s no change as the top players shared most of the points on offer in Sweden. Heading the ranking table is Lorraine Winstanley, who won the Swedish Open. Behind her is Deta Hedman, who came third in the Ladies Darts Organisation (LDO) Swedish Classic, and third is Holland’s Aileen de Graaf, who reached the quarter finals of the Classic and was runner-up in the Open. Currently in fourth is Swedish Classic and current World Champion, Lisa Ashton, with Anastasia Dobromyslova and Fallon Sherrock hot on her heels. Despite picking up 30 points in Sweden, Team Winmau’s 10-times World Champion, Trina Gulliver MBE, is set to miss out on a seeded place in the BDO rankings and will try to emulate her performance in 2016 by winning the Masters via entering the unseeded route. She is joined by other notable names such as, Paula Jacklin, Casey Gallagher, Anca Zijlstra and Tricia Wright. Anastasia finds herself just 12 ranking points behind Lisa Ashton with the Category A Vizcaya Open and England Classic events still to come for the Ladies. Fallon Sherrock has been making a late charge in recent times for a seeded spot with some fantastic form on the oche and finds herself trailing by just 14 points from Ashton in fourth.